A group, which teaches circus skills and runs a cafe for youngsters has won a national award for prevention and inclusion. Modo Circus with Purpose set up the Encounter Youth Cafe in Drummers Corner, Peterhead, in 2016 as a social venue offering positive activities for young people. During the past year, the group has welcomed more than 600 young people, clocked up more than 7,000 hours of volunteer time and signposted 80 young people on to other services or activities. 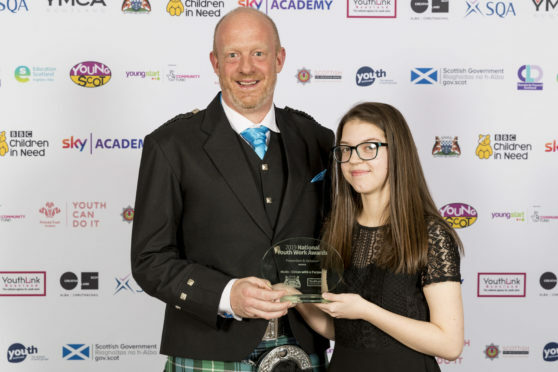 Modo Circus with Purpose has now been announced the winner of the National Youth Work Prevention and Inclusion Award by Youth Link Scotland. Director Martin Danziger praised both the staff and volunteers for all their hard work in creating the success story. He said: “This is a huge boost to the company and enormously important for everyone who has given so much time, enthusiasm and commitment to make Encounter a hub for young people and the wider community. Police have been working with Modo since 2015 to help reduce antisocial behaviour involving youths. Crimes of this type dropped by a third from 2015-16 to 2017-18 and, within the Drummers Corner area, diminished by 43% in the same period. There was a 30% overall drop in antisocial behaviour across the town. Buchan Area Inspector George Cordiner said: “I have no doubt that the work of Modo has been a significant contributor to this reduction. Their tireless work in Peterhead town centre has been of great benefit to Police Scotland. Laurence Findlay, Aberdeenshire Council’s director of education and children’s services congratulated the team on the win.